Koh Samui Thailands second largest island is Ko Samui, or often simply Samui as it is referred to by locals, an island off the east coast of the Kra Isthmus in Thailand. It is located close to the mainland town of Surat Thani in Surat Thani Province. Chaweng Regent Beach Resort, Chaweng Beach 155/4 Chaweng Beach , Koh Samui, Suratthani , 84320 Chaweng Beach, Thailand Accommodation. Score from 297 reviews: Very good 8.3 There are 5 people looking at this resort. Offering relaxing beachfront accommodation on Chaweng Beach, Chaweng Regent Beach Resort features 2 outdoor pools and a first-rate spa. It is a short walk away from the many entertainment spots, restaurant and shopping options of Chaweng. Explore Samui’s attractions with help from the tour desk or enjoy active workouts at the fitness centre. Regent Chaweng also offers free yoga lessons, a hot tub and sauna. Start the day with a hearty breakfast at Chom Talay, which features stunning views of Chaweng Bay. The award-winning Red Snapper Bar & Grill features Mediterranean specialities and live music. The air-conditioned rooms are fitted with a TV, a minibar and a safety deposit box. Featuring a bath or shower, private bathroom also comes with free toiletries and towels. At Samui Pink House guests will find a shared lounge area, a tour desk and a large terrace overlooking the palm garden. Laundry and airport shuttle services can be arranged. 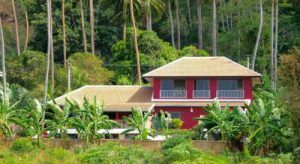 The guest house is located 1.6 km from Lamai City Center , 2.9 km from Grandfather and Grandmother stone and 3.7 km from Beach Republic Club. Samui Airport is 9 km away. Score from 71 reviews: Very good 8 There is 1 person looking at this hotel. Air-conditioned bungalows come with a private balcony. Each room has satellite TV, a safety deposit box, and tea/coffee making amenities. The attached bathroom provides shower facilities and a hairdryer. Guests can enjoy the private beach area, or watch in-house movies. Staff at the 24-hour front desk can help with tour bookings, car rental, and luggage storage. Buffet breakfast is served at the resort. Thai and Western dishes are served in the beachfront restaurant, while refreshing drinks are available at the pool bar. 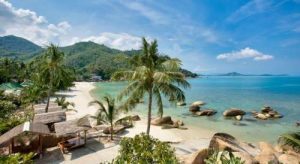 Crystal Bay Yacht Club Beach Resort is a 20-minute drive from Samui International Airport, and a 10-minute drive from Chaweng Beach. Many restaurants and bars can be found on Lamai Beach, within 5 minutes’ drive of the resort. They speak your language! Accommodation Hotel Rooms: 43. Groovy Map n Guide SAMUI. Beautiful Ko Samui, remains one of the loveliest islands in Thailand despite having been discovered for years! There are still myriad pristine, quiet, white sand beaches and coves with snorkeling galore, some places are still even tourist-free! Discover fisherman’s villages and places in which to lie undisturbed in the sun. We have the best of Samui here for you! 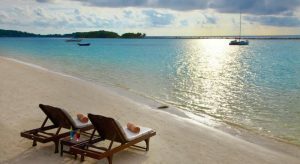 Dining, and beach bars, seafood, markets, shopping tips, beach spots, day trips to outlying islands, spas to get massages and just relax, sporty stuff for restless travelers who need to get their hearts racing, and a lot more. We give you our 24 hour Groovy Day of the best things to do on a typical day (if you have the stamina!) Maps are color-coded for reference. All places indexed and easily marked on maps and text-side. Just point and go. Groovy Tips as well: what to do and our insider advice. Groovy Samui. Take A Break Holidays takeabreakholiday, Koh Samui Accommodation.